Happy New Year to all you young and young at heart! Make some plans. Live some life. Dance the dance! 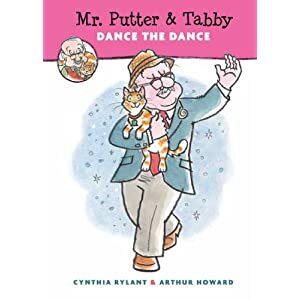 That’s just what Mr. Putter does in his newest adventure, Mr. Putter and Tabby Dance the Dance. Mr. Putter’s adventurous next-door friend, Mrs. Teaberry, convinces Mr. Putter to try ball-room dancing. Mr. Putter thinks of all the things he has to lose, “like his dignity and his nap time”. He hasn’t even danced since 1947. All objections aside, Mr. Putter dons his suit. Mrs. Teaberry grabs a (ball-room) gown and her good (hearted) dog, Zeke. Mr. Putter’s gentle old cat, Tabby, tags along. In the ballroom, Tabby loves the sparkles. Zeke jumps into the tango.And despite having two left feet, Mr. Putter cha-chas with his delighted date, Mrs. Teaberry. So, as 2013 is upon us, whether we are young, old, or somewhere in the middle, let’s lose the hum and pick up the drum. Let’s dance to the beat of the little wonders called good company and a joyful heart.